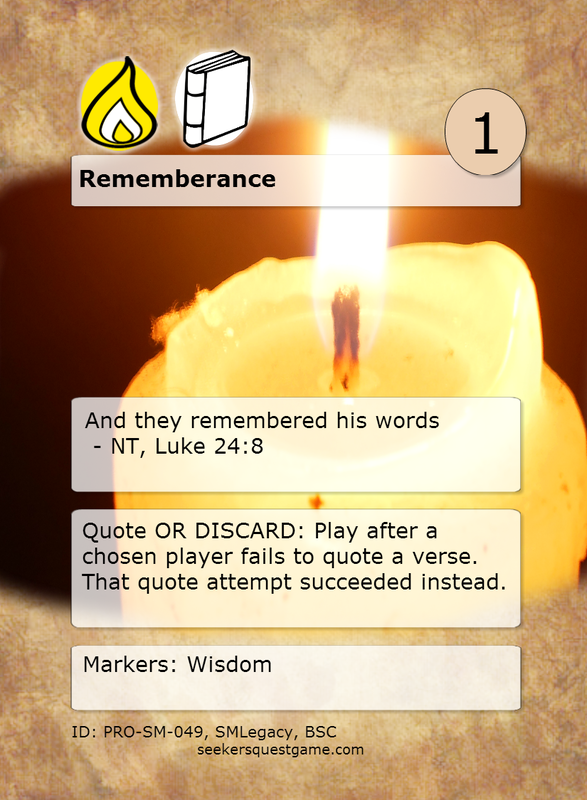 Verse Rule: Quote OR DISCARD: Play after chosen player fails to quote a verse. That quote attempt succeeded instead. So, this is kind of a fun and useful verse. In the context of the scriptures, it’s quite joyous. This is when the women returned to the sepulcher to tend to the body and encounter the angel. He tells them that Jesus has risen, and quotes them the things Jesus said about the resurrection. ...And they remembered his words. Then, they rushed off and told the apostles. In the context of the game, I had a little bit of fun with it. I kinda ripped it out of context and just thought of the text, and of remembering the words. First of all, it had to be a Quote verse, because that’s all about remembering the words. Then, what if you flub a quote? What if you mess up and don’t remember? It seems to me that you should be able to have a “gimme” card that lets you succeed anyway. That’s what this one does. If you fail a quote, either for a verse’s ability, or if you get challenged, you can discard this verse, and treat it like you had quoted it perfectly. It’s nice for some forgiveness, right? Like someone’s got your back. Other than that, it’s a nice way to drop a W or H icon for free, because the quote itself on this verse is really easy. Also, it’s a nice cheap throwaway verse in case you have to play some powerful 3-drop pearl verse! Like I said, a fun, useful verse! There have been times in my life when I just didn’t want to go to church. I think everyone goes through that a time or two. At those times, I often would try to talk myself into staying home by telling myself that I didn’t have to actually GO to church, I could just stay at home and study on my own, and that would be just as good. Maybe even better, on a day when the High Councilman was speaking. Even at the time, I knew that was wrong. I knew I was rationalizing. I knew that I would go back to sleep or get distracted or something and not end up studying. I also knew that I would miss out on the connectivity, the camaraderie of church. I know that church should be a personal spiritual experience, and we don’t go to just to socialize, but interacting with each other and strengthening each other is a very important thing, too. I think that’s why we’re commanded, in this verse, to go to church. Now, this particular verse, in game, isn’t particularly powerful. It only has one icon, Strength, and it has no verse rules. I think it’s very important to include a lot of these kinds of verses in a constructed deck. It’s nice to have cheap verses to fill in a chapter and allow you to close up a book. It’s also good to have sacrificial fodder. If you want to play something really big and cool, it’s good to have small, weak verses to sacrifice to play it. If your hand is filled with power verses, you’ll be less eager to sacrifice any of them. Verse Rule: Unique. ALSO, Quote. 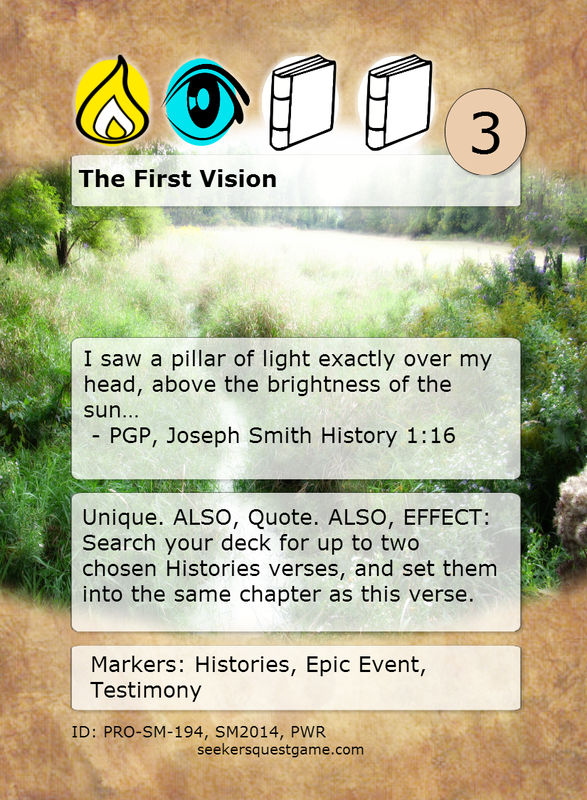 ALSO, EFFECT: Search your deck for up to two chosen Histories verses, and set them into the same chapter as this verse. This verse, in many ways, is the key to the Church of Jesus Christ of Latter-Day Saints. It describes the moment that God, the Father, and His son, Jesus Christ, appeared to the boy Joseph Smith in the woods near his home in Palmyra, New York, in a place we now call, “The Sacred Grove”. This one moment expresses so many of our core doctrines and beliefs. That God wants to communicate with his children, and does so through prophets, in all times and ages. That God and Jesus are separate individuals that work together as one. That God and Jesus are both physical beings with omnipotent reach. Such a defining event expressed on a game card should be huge, right? it should be a game changer. So, to be able to drop a bunch of histories icons on single chapter in one turn can really change it up. That’s plenty powerful, to be sure. Then, to be able to quote it and play it for free, well, that just takes it over the top. That’s why it’s also Unique. It only happens once in a game. Just like the event itself. Card of the week: Live Again! 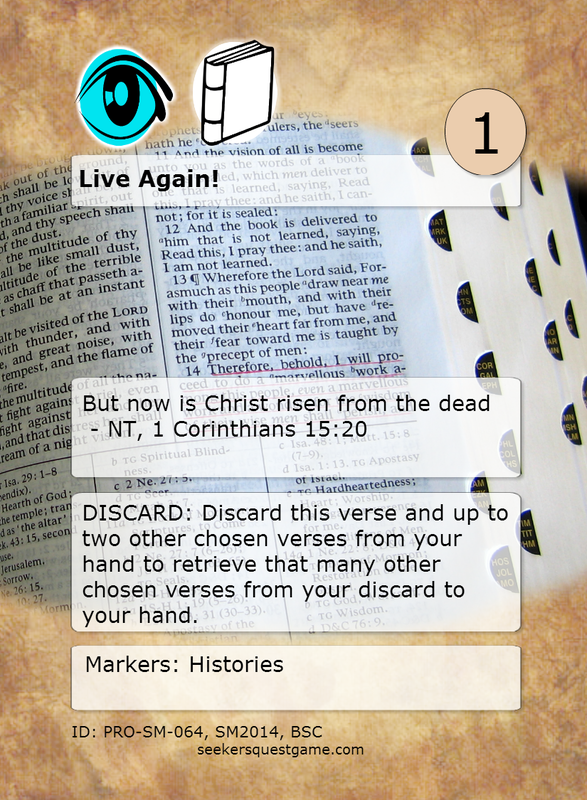 Verse Rule: DISCARD: Discard this verse and up to two other chosen verses from your hand to retrieve that many other chosen verses from your discard to your hand. This week, we continue on our quest for verses to help make our “Glory of God/Work of God” deck the most amazing deck ever. This one is a great helper verse. The verse itself is all about asserting the reality of the resurrection. What is amazing, of course, about Christ’s resurrection is that it sets up the gift of our own resurrection when the time is right. Resurrection is a gift that the Lord has given to us all, regardless of our choices or our circumstances. We are all saved from physical death. The atonement in the Garden makes it possible for us to repent and be saved from spiritual death. 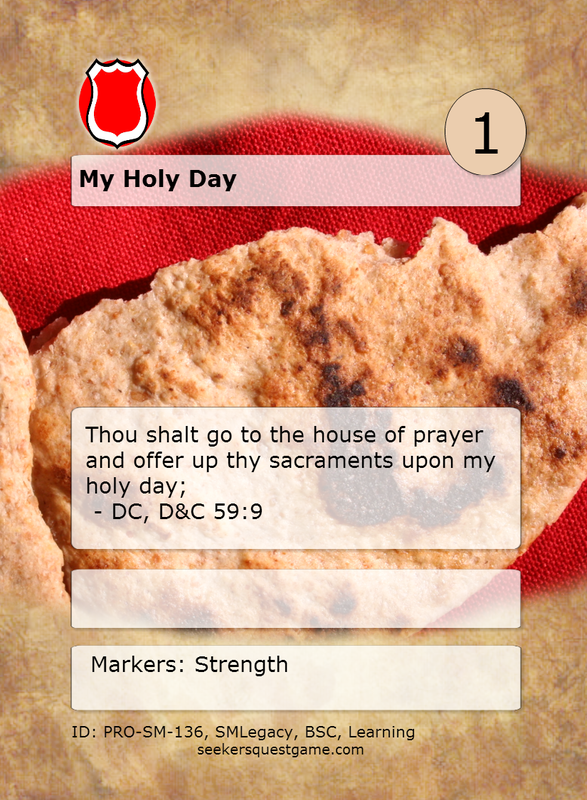 The beauty of this card in the Glory/Work deck, is that it can fetch those two verses back to your hand. Once you’ve played them and closed a book, of course, they go to your discard. But then, you can play Live Again! as a discard and retrieve them back to your hand to play again. Notice that you don’t retrieve Live Again! The wording on the verse means that you have to chose other verses, as it can’t fetch itself. So, the fact that Jesus has set us all up to resurrect is a part of the “combo” that allows Heavenly Father’s Work and Glory to move forward!